Merry Christmas everyone. I am sure by now, most people in England are up and have already eaten their breakfast and opened some of their presents. Christmas really is a day to spend with those closest to you, so I hope you all have a truly magical Christmas and are spoilt rotten by your loved ones. 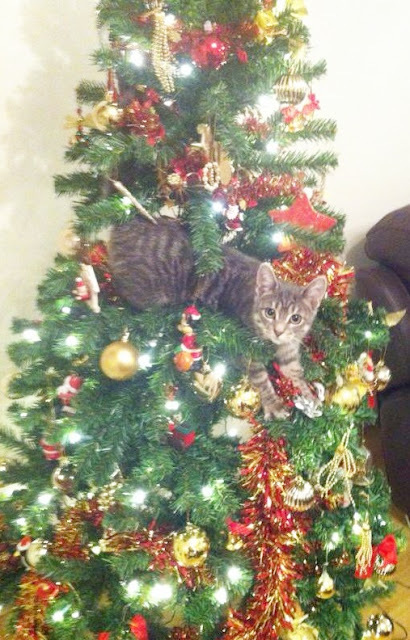 Here is a photo of my cat Lily thinking she is a Christmas Tree decoration. I will tell you a little about my Christmas tradition in the Powers household. My sister moved out November 2014 but both last year and this year she has come home on Christmas Eve, so we can all wake up and open our presents together. We wake up at about 8-9am (used to be 5am until we became grumpy teenagers who hated early mornings) and we go downstairs to eat breakfast in front of the fire. Then Sophie (my sister) and I have to open our presents in turn whilst our parents watch before they then open theirs. We then spend the morning watching Christmas films and Top of the Pops before having Christmas Dinner at 1pm and a Christmas buffet at around 5pm. My Granddad and my Auntie and Uncle come over on the evening for the buffet and to watch some films together. I love how Christmas brings everyone together as a family and it is nice to actually do something all together for once. Lastly, I hope all of those who are unable to be with their loved ones this Christmas, whether it be due to distance, work commitments or a death, have the best Christmas that they can possibly have. I can't imagine what you must be feeling to not be able to spend this day with the person/people you want to be with and I send my love to you. What did you all get for Christmas? Do you have any traditions that you and your family/loved ones do on Christmas day? These all sound like such sweet traditions! My family's from Austria so we open presents on the 24th. Happy holidays!! Yeaay! What a cute tree! Merry Christmas dear! I think it's absolutely lovely that your sister still comes home to open gifts together. It sounds like you had a brilliant Christmas, and how adorable is Lily?! Cheers to the new year, Lauren! Our Christmas was spent quietly with my small family of 3. We just had a midnight dinner preparation. We used to watch and enjoy fireworks right at our overlooking window but theres not much fireworks to witness this year. Your cat is the cutest! Mine would literally bring down the entire tree if she tried to do that, oh god! Aw Lily is so cute! Merry Christmas to you too, Lauren. Your cat is so cute! OMG I didn't know cats actually did that! Merry Christmas! Your cat is adorable! Merry Christmas! I love your blog it's so so cute! It sounds like a lovely Christmas! Your cat cracked me up!! Wish you a merry christmas! :) Hope you had a wonderful one. Wow! Your cat is soooo lovely!!!!!!!!! Hope you are having great holidays!